Home > Departments > Faculty > Jude Fernando Ph.D.
Jude Fernando is completing a book, Political Economy of NGOs: Modernizing Post-modernity, which examines the controversial social roles of micro-credit NGOs in India, Sri Lanka and Bangladesh and their links to the state, based on his long-term fieldwork in the 1990s. He was principal investigator for the project, “Sustainable Development and Civic Society,” funded by the Office of Sustainable Development and Intergovernmental Affairs of the U.S. Department of Commerce and in 2002 organized the international conference, “Sustainable Development in Urban Communities.” He has consulted for the Asia Foundation, IFAD and the World Bank. In Sri Lanka he worked in conflict zones for World Vision. 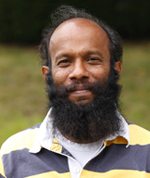 Fernando previously taught at the Department of Geography and Regional Development and the International College at the University of Arizona; Dordt College, Iowa; and was a visiting lecturer at the University of Colombo in Sri Lanka. Last year, Fernando and his colleagues in Sri Lanka established the Alfa Children and Youth Training Institute in Sri Lanka (ACUIS), a non-governmental organization (NGO) to assist children and youth affected by the Southeast Asian Tsunami of 2004. ACUIS resulted from the lessons Fernando learned while working with tsunami victims and conducting participant observer research on humanitarian assistance provided by existing NGOs in the region. He found many of these organizations rarely invest much time and resources for creating a viable learning environment conducive for long term formal education and vocational training facilities that would lead to sustainable employment and resettlement for the displaced children and youth. Fernando felt that a fundamental pre-requisite for improving the quality of life for those is a viable learning environment that would complement the services provided by the public school system. By using an experimental child-centered rights based approach model to social change, Fernando hopes to combine academic research with practical projects aimed towards positive social change. Read more. Political economy of post-disaster governance in Sri Lanka and New Orleans: An assessment of the governmental and non-governmental responses to natural disasters. Assessing vulnerability and sustainability of livelihoods in post-disaster situations: Application and critical analysis of a sustainable livelihoods framework. Gender dynamics of post-disaster humanitarian assistance in Sri Lanka. Impact of eco-tourism on indigenous communities in Dalat, Vietnam. Key Words in International Development. This is a dictionary on international Development to be submitted to Sage Publications, U.K. Publications. Fernando, J, L. “Culture in Agriculture vs. Capital in Agriculture: CGIAR’s Challenges to Social Scientists in Culture”, Culture in Agriculture, Vol. 29, No. 1 (2007). In press. Batterbury, J, and Fernando, J.L. “Rescaling Good Governance and Impacts of Political and Environmental Decentralization: An Introduction,” World Development, Vol. 20, No. 10, November 2006. pp. 1851-863. In response to Professor Mohamad Yunus receiving the Nobel Peace Price for Micro-finance, the Routledge Press will publish the paper back version of my anthology, Fernando, J.L. (ed. ), 2006. Micro-Finance: Perils and Prospects, Routledge Studies in Development Economics. London: Routledge. Fernando, J.L. 2006. and the Political Economy of Nongovernmental Organizations: Modernizing Post-Modernity. London: Pluto Press. (Forthcoming). Fernando, J.L., (ed.) 2005. Perils and Prospects of Micro-Credit: Neoliberalism and Cultural Politics of Empowerment. Routledge Studies in Development Economics. London: Routledge. Fernando, J.L. (ed.) 2003. Rethinking Sustainable Development. The Annals of the American Academy of Political and Social Science, London/Thousand Oaks, CA: Sage Publications. Fernando, J.L. (ed.) 2001. Children's Rights. The Annals of the American Academy of Political and Social Science, 575. London/Thousand Oaks, CA: Sage Publications. Fernando, J.L. (ed.) 1999. Progress, Promise and Partnerships: South Asian Development Experience. New York: Asia Society. Fernando, J.L. and A. Heston (eds.) 1997. NGOs: Charity and Empowerment. The Annals of the American Academy of Political and Social Science, 554. London/Thousand Oaks, CA: Sage Publications. Fernando, J.L. “Micro-Credit and Empowerment of Women: Blurring the Boundaries Between Development and Capitalism,” in Prospects and Perils of Micro-Credit: Cultural Politics of Empowerment. Routledge Studies in Development, UK, 2005. Fernando, J.L. “Micro-Credit and Empowerment: Visibility Without Power,” in Prospects and Perils of Micro-Credit: Cultural Politics of Empowerment. Routledge Studies in Development, UK, 2005. Fernando, J.L. and Simon Batterbury, “Local Politics, Poverty and Decentralization,” World Development, January 2007. Fernando, J.L. “Rethinking Sustainable Development: What is to be done?” The Annals of American Academy of Political and Social Science, November 2004. J.L. Fernando and Batterbury, S.P.J and “Arturo Escobar,” in P. Hubbard, R. Kitchin and G. Valentine (eds.) Key Contemporary Theorists on Space and Place. London: Sage Publications, 2004. J.L. Fernando and Batterbury, S.P.J “Amaryta Sen,” in P. Hubbard, R. Kitchin and G. Valentine (eds.) Key Contemporary Theorists on Space and Place. London: Sage Publications, 2004. Fernando, J.L. “NGOs and the Production of Indigenous Knowledge Under the Condition of Post-Modernity,” The Annals of American Academy of Political and Social Science, November 2003. Fernando, J.L. “Civil Society and its Discontents,” in World Encyclopedia of Peace. Oxford: Pergamon Press, 1999. Fernando, J.L. “Political Economy of Child Labour,” in Canagarajah, S., (ed.) Child Labour. Washington, DC: The World Bank, 1998. Fernando, J.L. “Non-Governmental Organizations, Micro-Credit and Empowerment of Women: A New Orthodoxy in Development,” The Annals of the American Academy of Political and Social Science, Volume 554: 150-177, 1997. Fernando, J.L. “NGOs Between States, Markets and Civil Society,” The Annals of the American Academy of Political and Social Science, Volume, 554: 1997. Fernando, J.L. “Disciplining the Mother: Micro-Credit Programs in Bangladesh,” Ghadar, 1:1, 1997. Fernando, J.L. “Sustainable Development and Ethnic Minorities: The Garo Tribe of Bangladesh,” Canada-Bangladesh Partnership Journal of Sustainable Development, 2, 1997. Micro-Finance, Neoliberalism and Cultural Politics of Empowerment, Invited Public Lecture, Leigh University, and Bethlehem, PA, 16th October, 2006. “A Political Economy of Tsunami and Katrina: Representations, Policies and Impacts,” Department of Geography and Anthropology, University Of Melbourne, Melbourne, Australia, 16th March, 2006. Nongovernmentality: Political Economy of Nongovernmental Organizations in Sri Lanka and Bangladesh, State Capacity, Social Scientist Association, Sri Lanka, Hotel Renuka, Colombo, Sri Lanka, 16th August, 2006.